At last! A cost-effective parenting simulator with the ôday careö feature teachers have been asking for! 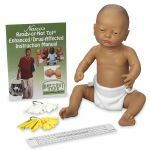 Now the FIRST manikin to simulate a babyÆs varying needs is even better! The Day Care Pause lets you pause the simulation so students can bring their babies to the ôday care centerö at school and continue the simulation at the end of the day. Use the baby sitting feature to interrupt the program during the day. 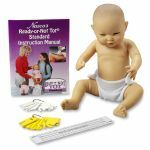 After school, simply reactivate the program and return the manikin to the student to continue the simulation. The program will resume where the simulation left off in the morning. This provides a more realistic way of carrying out the simulation without interrupting other classes. After all, in the real world, teen parents are not allowed to carry their children with them throughout the school or work day. Teen parents must find proper day care, just as all other working parents. 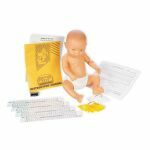 This feature not only makes it easier to conduct the simulations during the normal weekday, but also is a great way to introduce the subject of day care! 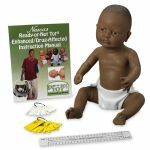 Three programs simulate normal baby-tending needs along with fussy periods in each program; 25-27 tending occurrences in each 48-hour program. 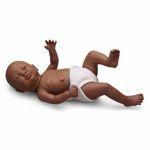 A fourth, more demanding program simulates the more irritating cry of an alcohol or drug-affected baby; requires care 31 times during each 48-hour program. Includes a ôpanicö key for quieting difficulties without discontinuing the entire simulation.